Four Levels of essay "TV Can Be A Good Parent". 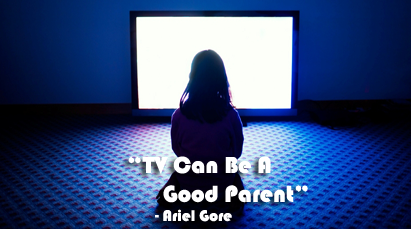 "TV Can Be A Good Parent" is written by famous novelist Ariel Gore. Ariel Gore (born June 25, 1970, in Carmel, California) is a journalist, novelist, notification author, and a teacher. She is the founding editor/publisher of Hip Mama, an Alternative Press Award-winning publication covering the culture and politics of motherhood. In this essay "TV Can Be A Good Parent" Ariel Gore argues about the use and need of TV. Question Answers Of "TV Can Be A Good Parent"
Four Levels Of "TV Can Be A Good Parent"
1. Literal Comprehension: This essay is written by an American mother Ariel Gore which is a reaction to the guidelines by the American Academy of Pediatrics which says television watching as harmful to babies and toddlers. In this essay, Ariel Gore defends the use of TV for children and toddlers. She claims that the AAP pays no need to the poor conditions and mothers, but insists them on not allowing their kids to watch TV. In the past neighbours and other members in the family would look after the babies. But a single mother today cannot devote her time to her homework and jobs if the kids are not allowed to watch TV. Actually, children can be interested in TV as well as with human beings. There are many TV programmes which conveys a lot of good messages. Kids learn so many things while watching TV. Although TV is not the best thing, poor working mothers can get time to earn money and make life tolerable when everything is so expensive. Therefore, watching TV for children and toddlers is nothing harmful. It should not be forbidden for them because modern equipments like TV, Computer, Radio, Mobile, etc. are useful for every person. To keep far from these is unjust. 2. Interpretation: This essay is an argument against a report of the American Academy of Pediatrics. Ariel Gore tells us that the poor conditions of single mothers, and that the AAP is ignorant of such conditions. Gore argues against a report that only sees the negative influence of television on children. There are many positive influences also. Gore has found educational television personally beneficial for times when she was not able to be there for her daughter. While attending college and having a full time work schedule, the television was at times a trusted co-parent, providing her daughter with fun and education. She argues that no machine or equipment itself can do nothing; neither it harms nor gives benefits. It depends on the person it uses and the time they elapse. 3. Critical Thinking: In this world human being is the supreme creature of all the creatures on earth. As an enthusiastic creature he has developed many things for his comfort and fulfillment of his demands and needs. Science and technology has greatly changed the world. Different inventions have both positive as well as negative impacts on human and other animal life. A very single thing may be fruitful or harmful. Modern inventions are useful for all kinds of human only if they are used properly. The author presents the modern life and the condition of children and mothers critically. She does not totally disagree that too much watching television can be harmful to children in long run. However, she does support is educational benefits when used correctly, and believes that before banning television from children, we should make stronger attempts to provide more educational programming for all ages. We should right use of all kinds of modern inventions. 4. Assimilation: I think this is a matter of great discussion in today's world. It gives a good message for all people about the good and bad impacts of modern technology and science. I am very much impressed with the writer's view on watching Television. Actually, we are not guilty as the traditional people say. We watch television to kill the time and to get a lot of useful information. We should be completely choosy. Before this essay I used to think that watching Television and playing games on computer for children is worthless. When I read the arguments of Ariel Gore, I came to know that these are useful only when we use them properly. Bachelor Level Course "TV Can Be A Good Parent"
0 Response to "TV Can Be A Good Parent | Four Levels"